Who doesn't love fun and fabulous party and hosting ideas that don't break the bank? Keep up with Amber's top tips in her blog. I love Easter! These cute bunnies are easy to make and will delight kids big and small. Made from small washcloths, you could easily replicate with larger pieces of white fabric and place on couches or beds. The basis of the design was borrowed from here but for a simpler look, leave off the googly eyes and pom-poms. And once completed, a small pocket at the back makes for a perfect spot to hide an egg. Happy bunny making! I love Easter and it doesn't take much to get your home "bunny" ready. A sprinkling of pastel colours, spring flowers and of course, decorated eggs set the stage nicely. Every year I dip and dye a batch but this time around, I decided to adorn my eggs in two new ways and I love the results. After a quick dip in some food colouring, vinegar and boiling water, I brought out my typewriter letter stamps and imprinted the eggs with seasonal words. 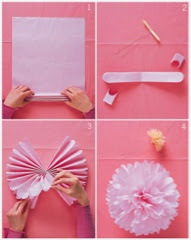 This would be a fun way to create place settings for Easter brunch or dinner. The end result is really effective. The second way was to add some classy scrapbook stickers of chicks, bunnies and flowers. Just don't overdo it, less is more! Display your eggs using egg cups or shot glasses, add a sprig of spring, a bunny and voila, you have an easy Easter centrepiece. Have a wonderful, chocolate-filled weekend and happy egg decorating! Know someone who got engaged over the holiday season? I love these “I Do” Shoe Talk decals made with blue pearls and crystals. They give you your something blue in such a tasteful way and your wedding shoes a bit of personality. They are perfect for photo shoots too. These combined with a wee card would be such a nice way to say congratulations! And at $6.98, they are at a great price point. Check out www.happilyeverafterstartshere.ca for these and other great decor. 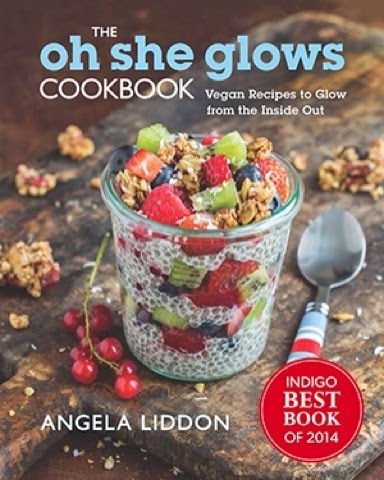 Recipe was first featured on hotbeautyhealth.com via Diana Ajih. I love fall. And I especially love Halloween. I am always looking for easy ways to decorate inside and out. Enter fancy white pumpkins! These little beauties require a pumpkin and some fishnet pantyhose or black lace. Simply wrap the pumpkin and display beautifully. They looks great in small groupings on a mantle or as a dining table centrepiece. Happy decorating! The latest Disney phenomenon is "Inside Out" and it has captured the heart of my niece. For her birthday I wanted to give her a small party with an "Inside Out" theme but with the film being so new and no branded party supplies in stock, I had to improvise. Colour plays a big role in the film and I decided rainbows were the best way to illustrate all of the characters plus they are easy to find and incorporate. Cake: I had the bakery decorate her cake with a rainbow and instead of the traditional Happy Birthday message, I had them write "Who's the birthday girl?" - one of the funniest lines from the film. Next, I used the Holiday Ornament template found here and printed it off in colour. Cutting each out and attaching them to toothpicks, they gave the cake a true "Inside Out" theme. Decor: For decor, I had balloons in red, green, blue, yellow and purple to represent the characters of the film. I would also suggest a rainbow tablecloth and rainbow streamers to brighten the room. Her gift was in a very large rainbow bag that provided a backdrop to the side table (and enclosed Inside Out PJS!). Favours: For favours, I found rainbow dance streamers and rainbow hair clips that the kids loved. You could also include an Inside Out colouring book which are out in stores now. There is much more you could do but these few things really carried the theme well and the look on her face was pure delight! If you rent or own, there are always things you need to buy to make your space work. This is a gift that will get used. Easy to find and available all year, this is a great gift for condo dwellers and house owners alike. Go low maintenance if you can and nothing too large. I'm currently loving succulent gardens as they fit both criteria. Feeling a DIY? Try the succulent wreath featured in the photo with how-to by prettyprudent.com. Wine so your home has joy and prosperity, salt so that life will always have flavour and bread so the house will know no hunger. It's practical and easy to assemble. Plus you can include the sweet feel-good symbolism in the card or with tags on each item. Easy to make or to order online; designs range from something fun with caricatures to traditional typeset. Inexpensive and personal. As for no-nos: art (unless they have specifically selected a piece), furniture or anything to do with redecorating the house (paint, curtains, throw pillows, carpets, etc). These are far too personal and decisions that should be left to those who live there. I recently planned my high school reunion (this was number two!) and there are a few tips I though I'd share that made ours a success. 1) Give people lots of notice! I secured a date and started spreading the word in September for our June event. This gave people who were coming from out-of-town lots of time to plan. 2) Keep the ticket cost low and the event casual. I know of three sit-down dinner reunions that have been cancelled due to low attendance. Keeping it at a pub allowed people to come dressed like they want to, the opportunity to stay for as little or as long as they wanted and gave people the freedom to move about and chat. 3) Provide name tags. People do look different and even if you recognize their face, after 10, 20 or 30 years, you won't remember everyone's name. Go the extra mile and photocopy grad yearbook photos and attach that to the name tag. 4) Plan some element of surprise. I had a 90's themed candy bar, provided some fun 90's props plus a cool Instagram frame and at 10pm circulated mini cupcakes in school colours. Overall it was a super fun night with many people suggesting another reunion sooner the later. Best of luck with planning and if you want any details on the candy bar, ticketing, name tags or photo props, please send me an email. I'm happy to help. Know someone expecting a baby and looking for a gift? I love these Baby Milestone cards to mark baby's first year of accomplishments. Gorgeously illustrated with a space for a date, just add to your baby's photos and you have a beautiful way to keep a record of memorable moments. Just found out your expecting? They also have a sweet set of milestone cards to mark your pregnancy progress and your belly grows. Sure beats those handmade signs in photos we've all seen on Facebook. Visit milestonecards.com for store locations near you. It's getting warmer and outdoor entertaining is in full swing. It's time to crack out the summer cocktails. Now I'm normally partial to sangria or a great margarita on the rocks but one sip of this Strongbow Ginger Cider Cocktail and I was hooked. Plus it's gluten-free friendly. Mix juice, ginger and bitters. Add ice and cider. As we get older, we fill our homes with all kinds of things - buying what we need or want. This can make gift giving very difficult as we try to find something unique and inexpensive that says Happy Birthday or Thank You that isn't flowers or wine (not that I don't love receiving either!). studs. They are so sweet and stylish. And at $10 a pair, they won't break the bank. They are the perfect token gift that says "I thought about you." 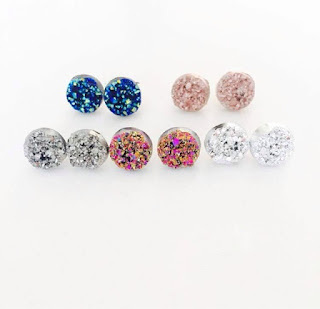 I bought the Faux Druzy Studs in rose gold and love their understated sparkle. Promise the next pair I buy will be gifted. After our porch renovation last summer, I secured the perfect furniture set but had not found the right pillows to complement our new house paint colour. I love bright summer prints, but wanted something that really worked with our victorian house. 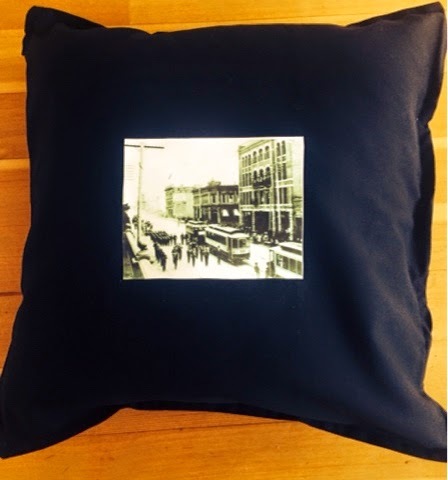 So, I had this vision to create pillows with historical photos of the City we live in and from the year our house was built. I scoured our local archives and found a number of digital photos from 1895. I copied them to my desktop and printed them in a 5x7 format on Jolee's iron-on transfer paper for dark fabrics ($9.99) from Michaels. You must use an inkjet printer and I suggest cutting your images down to exactly what you want transferred on your pillow, otherwise you'll end up with white borders. I used IKEA cushion covers ($5.99) and a quick iron on your highest setting and voila, they were done. I now have some very unique porch pillows that are a real conversation starter and look so good on the porch. I'm a cookbook junkie and recently picked up The Oh She Glows Cookbook by Angela Liddon and just had to make the 15-Minute Creamy Avocado Pasta. Boy, was I not disappointed - it was so good. I didn't have the suggested basil, so I substituted cilantro. It's a super summer pasta recipe and guest worthy too. I'm often asked about my favourite gifts for baby showers. Here a few suggestions from the complete DIY to a high-end option as featured on Shaw's That Talk Show. I am in love with these "lovingly curated" mom & baby gift boxes created By Broken Arrow. All local Vancouver products including a fresh flower arrangement from my go-to florist, Flower Factory. These adorable wool slippers from Padraig Cottage I have mailed all over Canada. They are durable and oh-so-comfy that I would like a pair for myself. Looking to up your presentation on those baby onesies you are gifting? Look no further then the cupcake wrap. It's a modern twist on the diaper cake and the complete instructions can be found here at Chica Circle. Lastly, the felt bird mobile is very easy and inexpensive - this entire mobile cost under $2! All you need is felt, craft cord, scissors and a branch to hang it from. The bird template for your use is here. Trace the template onto the felt and cut out each bird. Cut a small hole in the top of the bird for the cord to tie onto. Then tie onto the branch at varying lengths. This gift is nice because it can be customized to the theme or colour scheme of the nursery. 1. Stack five to ten sheets of tissue paper. Make 1 1/2-inchwide accordion folds, creasing with each fold. 2. Find the centre and tie off with string (at least 18 inches) leaving one long end. 3. With scissors, trim ends of tissue into rounded or pointy shapes. 4. Separate layers, pulling away from center one at a time and fluff. Love the idea of your next veggie tray being all cut perfectly? 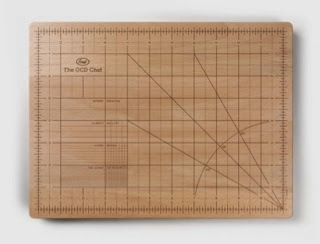 I recently came across the Obsessive Chef Cutting Board and it quickly made it onto my wish list. Not only useful but a great conversation piece. Available through Amazon for about $35. Every year, I have the same conversation with friends about etiquette around the appropriate time frame for wedding thank you cards, so I am setting the record straight. According to etiquette guru Emily Post, newlyweds do not have one year to send out thank you cards. 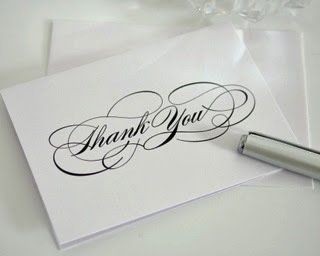 A bride and groom should send a thank you card upon receipt of the gift or shortly there after. However, a guest has one year from the date of the wedding to give a couple their wedding gift. Although, I always recommend buying from the registry well in advance for optimal selection. 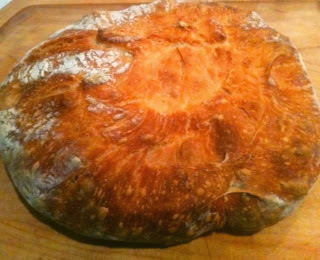 The idea of making my own bread was far too daunting of a task until I came across this excellent recipe in Edible Vancouver Magazine. I made a loaf this past weekend for guests coming over and it was so delicious, I started another loaf the next morning. Trust me when I say this is one easy no-knead bread that will be met by rave reviews. Enjoy warm with a bit of butter. Recipe courtesy of New York Times: http://www.nytimes.com/2006/11/08/dining/081mrex.html?_r=0. I love to embrace every holiday from Valentines to Thanksgiving and a little bit of classy decor can go a long way in celebrating the seasons. This Easter I have purchased a beautiful white ceramic bunny for my dining table. It is understated but says Happy Easter all the same. Plus, it won't compete with my white serving ware. And classy doesn't have to mean expensive. $12.99 at Winners. Amber Orchard has been planning events for over 20 years. From galas to festivals to weddings, she has planned events for the non-profit, corporate and private sectors. Be My Guest is a blog for people who enjoy entertaining, from throwing dinner parties to planning social events. Visit often for party planning tips, recipes and fabulous products that will wow your guests.